You might want to start by making your syrup if you're not good at multitasking. In your favorite sauce pot mix all the syrup ingredients and het over a low heat. Once your Margarine begins to melt, use a spatula to blend it in. Let it simmer until it begins to bubble and then remove form heat. In your punahele large mixing bowl mix all the waffle ingredients except the Pineapple Slices and Shaved Coconut until smooth and creamy. 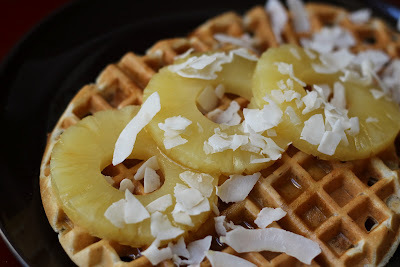 Make your waffles following the instructions on your waffle iron. Let's be honest they're all different - some need no-stick sprays - some don't. So follow the instructions for your waffle iron and if it has a temperature setting - I recommend the highest setting. 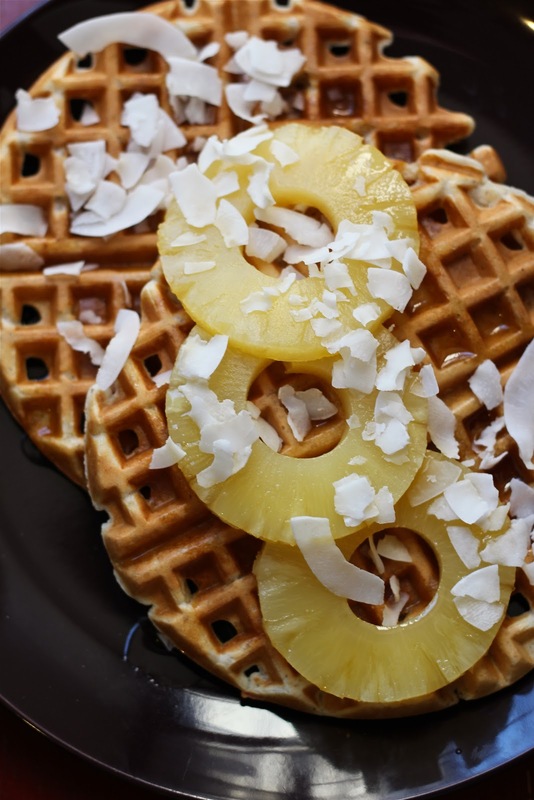 Once you have waffles, warm syrup and your toppings ready... well all that's left is putting together your tropical brunch staycation and be as happy as this lady. * There's a dirty joke there but it's too obvious. We're all too good for that. Holy WOWZER do those look good!